If you have already signed a housing contract, and will not live on campus, you must submit a Contract Release Request. The process is the same for both the current academic year for current residents, and the upcoming academic year for incoming students. After the Contract Release Committee reviews your request, HRC will notify you of the committee’s decision via your Crimson email account. For any student requesting contract release for any reason(s) other than not attending UA, allow up to two weeks after submitting the release request form. This form is a request submitted to the Contract Release Committee for review. Approval is not guaranteed unless the student is no longer going to attend UA. The committee will not release students from their contracts at any time to move to off-campus or sorority/fraternity housing. If the contract release request is approved, all release fees, prorated housing charges, and other charges as stipulated by the housing contract apply. HRC charges a $500 cancellation fee to students still enrolled at UA. Students must satisfy all financial obligations to UA before HRC issues any refunds. If a release request is denied, the student is responsible for fulfilling all terms and conditions (including payment, damage fees, etc.) of the contract. Students requesting contract release after October 10, but prior to the opening of the halls for spring semester, are responsible for rent through the end of the fall semester. Students requesting contract release after March 1 are responsible for rent through the end of the spring semester. To access the contract release request form, students must log in to their myBama account. 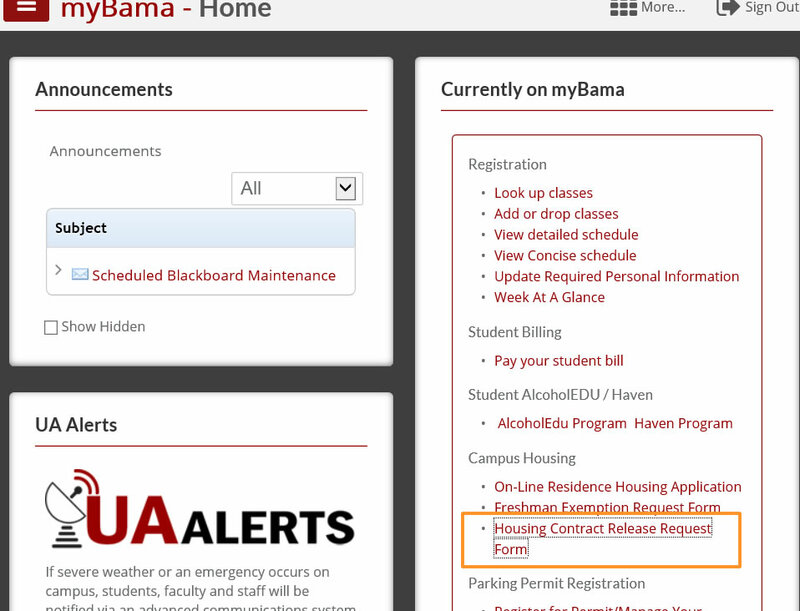 While on the Home tab, select “Housing Contract Release Request Form” from the right column titled “Currently on myBama” under the “Campus Housing” header.